Yesterday Amanda and Marci put in the fire breaks for the two ends of the south slope. This is always an essential task early in the spring. The photo above shows the west end, which includes what we call Kathie's Prairie (Unit 1, the highest quality area). This was an area that due to the nearby quarry was protected from grazing by a fence, and consequently has lots of grazing-sensitive species such as lead plant and prairie dropseed. 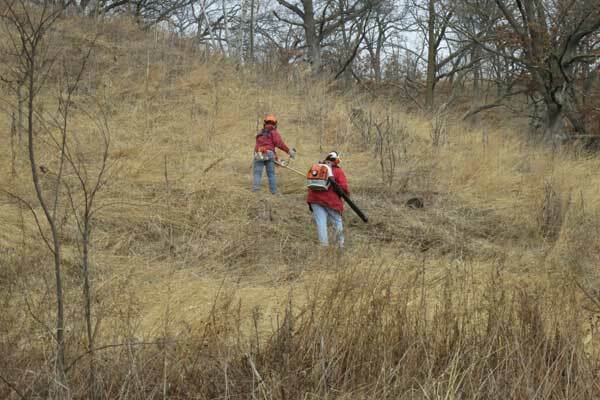 Across the top of the south slope we have a wide mowed ATV trail which serves as a good fire break, but it is too steep at each end for utility vehicles so we have to hand-mow down the hill and around the quarry. A brush cutter is used to mow the break, followed by a leaf blower to clean off the thatch. The crew starts at the bottom of the hill, works up to the top, then widens the break as they come back down. The east end (shown in the photo below) is similar but simpler since there is no quarry. It may look a little "wild" in the above photo but it is actually a lot cleaner than it looks. As the photo to the left shows (from 2011), a nice blackline can be created along the hand-mowed fire break. However, it takes a good-sized crew, since we need two or three waters with the drip torch. The sandhill cranes were here on February 21, 2012. On Feb. 19 they weren't here yet, so they have just arrived. There were three of them, perhaps the same three we had last year who stayed around until October? Bob Wernerehl reported yesterday that there was a flock of tree sparrows on the south-facing slope, presumably heading north to their breeding ground in the tundra. Susan heard and then we all saw eastern bluebirds near the east end of the Valley Prairie. Kathie cleaned out the bluebird houses last fall and went around two weeks ago and closed all the doors. We generally are quite successful with the bluebird houses, although we also have plenty of natural nesting sites in snags. Canada geese are nesting again. Last Thursday when we were spraying willow in the marsh they were flying over at low altitude. We have lots of open water, since we have plenty of springs and seeps. One of the attractions of our hilly oak savanna landscape is the thick sandstone beds that provide a great reservoir of groundwater to the Wonewoc Formation, which underlies our wetland. When you walk through our sedge meadows you have to keep careful lookout for small seeps and springs. Some of them are no more than a few feet across, but they never freeze, even in a cold winter. This week we will be starting to work on our fire breaks, since it won't be long before we'll be burning. Exciting time! Just returned from Menomonie, Wisconsin where Kathie and I attended the annual conference of The Prairie Enthusiasts at U.W. Stout. Although I always profit from these conferences, this year was especially nice because Stephen Packard was the keynote speaker. Steve Packard did pioneer work on oak savanna restoration in the Chicago area, and is still active. About five years ago he gave Kathie, Susan, and I a private tour of Somme Prairie Grove, his signature savanna restoration site. It was great to be able to talk with Steve again and hear the two talks he gave. A nice book describing Steve's work in considerable detail was published in 1995 by New York Times science writer William K. Stevens. It is entitled "Miracle Under the Oaks: The Revival of Nature in America" (Pocket Books, New York). Here is a brief precis: "Our planet is nearing ecological disaster, but a vital restoration movement involving everyday people and private organizations like the Nature Conservancy has sprouted up in America. Miracle under the Oaks brings alive one of its victories--the revival of a long-lost ecosystem along the Chicago River. Here is the triumphant story of a grassroots movement to help heal the planet--and a blueprint for future change." An essential "read" for anyone carrying out oak savanna restoration! The all-day meeting and evening banquet provided a chance to talk with a number of people doing interesting work on prairie and oak savanna restoration. The evening before the meeting, a lot of prairie enthusiasts met for dinner and conversation. I got to dine with Steve and with Mark Leach, another pioneer savanna researcher. In addition to the oral talks, there were poster presentations, and I contributed one entitled "Buckthorn as a Calciphile: Identifying Low and High-Risk Areas", which is a more detailed version of a blog post I made several years ago. Lots of cut brush is created from savanna (and to a lesser extent prairie) restoration. Depending on the situation, brush is either burned as it is cut, or it is piled for later burning. We have dealt with hundreds of brush piles at Pleasant Valley Conservancy, and our technique has improved through the years. 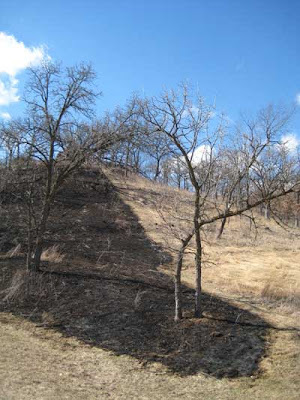 (In the winter of 2000 we burned 235 brush piles on the south-facing slope!) Mostly, we have learned the brush-pile "art" from Paul Michler, one of our contractors. He introduced the use of drip torch fuel (2-3 parts diesel to 1 part gasoline) to start the fire. Every year we build a brush pile at the edge of Pleasant Valley Road, and use it for the odd brush that we need to get rid of. We can pull up the truck and toss brush on the pile. Also, bags of sweet clover, hedge parsley, or other invasive weeds are tossed on this pile. By the end of the season we usually have a fairly substantial pile. This year it was larger than normal, so we ended up with two separate burns. 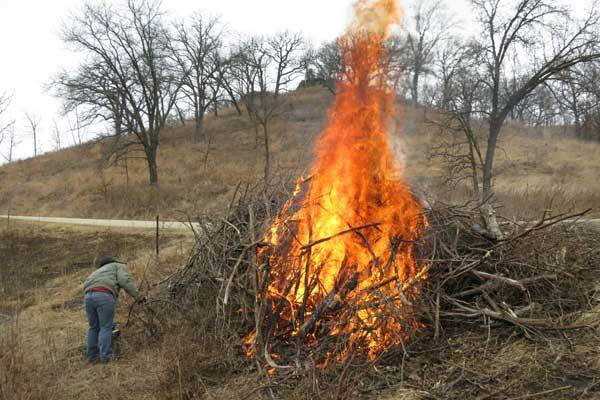 The secret of burning a brush pile is to start with really dry wood. In December 2011, when we did the first burn on this pile, some of the wood had not "cured" long enough, and only part of the pile burned well. So we reconsolidated the rest into a second pile and let it cure for another two months. As the photo shows, this pile burned very well. After getting it started, we started working on willows in the wetland. Within an hour this pile was mostly burned up, at which time we returned and consolidated the partially burned wood. Consolidation is the main work on a burn pile, although I find it enjoyable. You need a pair of sturdy (but old) leather gloves. A long-handled pitchfork is also essential, although a garden rake or shovel will also serve. The key is to build a small, hot fire with smoldering logs in the center of the former burn pile and carefully place all the other partially burned logs on top. Keep the burning pile as compact as possible. It may take an hour to consolidate a pile properly, but you'll be happy you did so. Done right, you should be able to return the next day and find only ashes. Since the fire sterilizes the soil, it is important to plant the area with a good seed mix. First, the ashes have to be removed, either with a leaf blower (if it hasn't rained or snowed) or a garden rake. Then hand sew. Done right, in a year or two the site of the burn pile will be no longer visible. As the photo shows, the flame height can be high so it is essential that a burn pile be built out in the open, away from any trees. 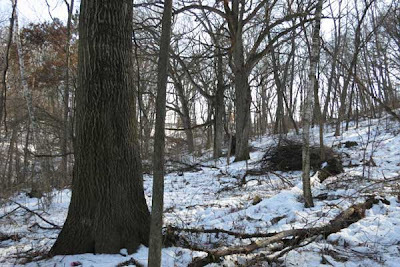 When clearing a heavily forested area, it may be difficult to find suitable sites for piles. If so, then it is important that the piles not be built too large. Since you are going to burn the woods, you don't have to burn the piles separately, as they will quickly burn up when the woods is burned. 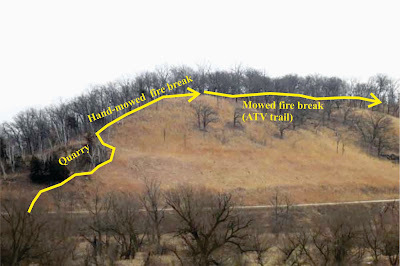 Farmers in the hill country of southwestern Wisconsin always burned their hill pastures in the early spring in order to encourage green-up. I was interested in how they started their burns and was fortunate to have a neighbor (now deceased) who had lived on his farm all his life. He told me that their pasture burns usually started as "escapes" from burning brush piles. Once the fire started, they just let it burn. The farmers around here still cut lots of brush, mainly along the edges of their planted fields, but these days rarely do they burn the piles. They just let them sit, where they become great wildlife habitat. Although our wetland is high quality, it is hard to get it burned on a regular schedule (F & WS burned it in 2005 and 2010), which means that invasive plants like willows are able to gain a foothold. Although our principal focus is on savanna and prairie restoration, we hate to see our wetlands deteriorate. With the cold weather and lack of snow, this seems like a good time to deal with some of the willows. This week we have been using the basal bark technique with Garlon 4 to kill scattered willows. This is probably the cheapest method. Labor cost is low since it avoids cutting, stacking, and burning. Although the dead willows will remain, they will rot away in a year or two. With the temperature down into the 20s F at night, and no higher than 35 F in the day, footing on the frozen ground is fairly good although we have to avoid getting into any areas of upwelling ground water. We seem to have two kinds of invasive willows, shrub-like and tree-like. The shrubby willows are scattered (see photo) and are fairly easy to deal with. In fact, many of the older stems are dead and do not need to be treated. The trick is to get the spray nozzle into the center of the bush, and be sure to spray both sides of each stem. The tree-like willows are fairly small in size, but fiercely clonal and tend to take over a whole wetland. There are some areas along Wisconsin 78 by Vermont Creek that are completely covered with 6-10 foot high trees. We have a few (fortunately small) clones of this type, as can be seen in the background in the photo below. The basal bark method is not the way to deal with these. If the access permits, a forestry mower would be the best approach, although treating all the cut stems would be impossible. Better might be to return after mowing in early summer and spray all the resprouts with Garlon 3A. 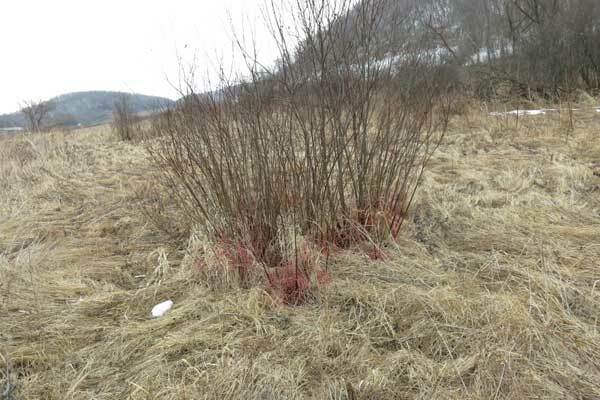 This year we are only dealing with the scattered willow shrubs. We'll see about next year! I have posted on this topic in earlier years, but it deserves repeating. Now is the time to think about using the technique described below. Smooth brome (Bromus inermis) is one of the more persistent problems in any restoration in our area. Any former ag field that remains fallow for any length of time is soon taken over by it, or by quack grass or some other grass that spreads by rhizomes. Roadsides also become dominated by such grasses. Although some sources state that smooth brome can be controlled by carrying out late spring (May or later) burns, we were never able to eradicate it that way. However, we have been very successful in eradicating it without damaging native plants by carefully timed herbicide (glyphosate) treatment. The principle of this method, first suggested to me by Jim Sime, is based on the fact that smooth brome is a cool-season grass and appears quite early in the spring, long before any native species are evident. The herbicide glyphosate has the useful characteristic that it is completely inactivated by soil particles so that there is no residual activity. Only plants that are above ground will be affected. If it's green it will be killed. Timing is critical, and leaves about 4 inches tall are ideal. The technique works very well, and we have used it in four of our planted prairies (Barn, Crane, Ridge, and Valley), as well as at the Gateway Prairie at Black Earth Rettenmund State Natural Area. Also on the road cut of Pleasant Valley Road. For small areas, Kathie and I have used backpack sprayers, but for fields or roadsides it is much cheaper to have the local agriculture co-op come in with a big boom sprayer. At least in our area (Premier Cooperative) they have been very helpful and will come on a day's notice. Because the weather varies from year to year, it is essential to monitor the target site carefully. The first of April or the last few days of March have been ideal in our area of southern Wisconsin. 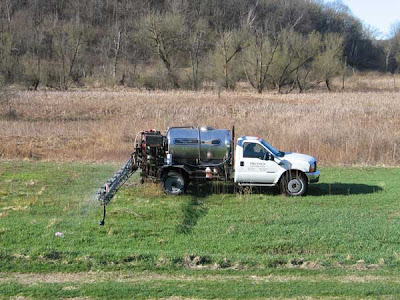 The photo below shows the Barn Prairie being sprayed. This was the first prairie we sprayed and I think it should have been treated a few days earlier, as it looks a little lush. In fact, golden Alexanders, one of the early prairie plants, was set back noticeably by this treatment, although it was fine the following year. 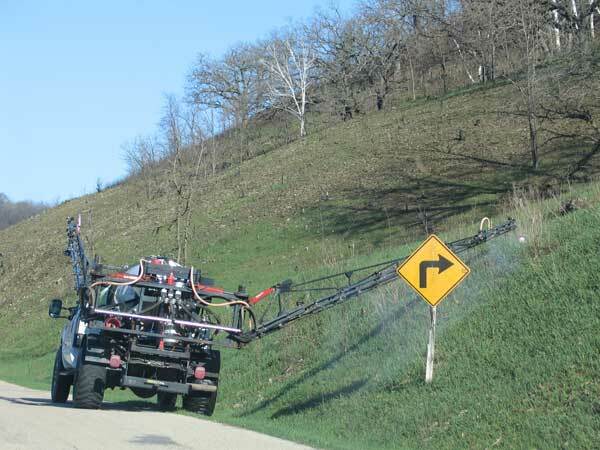 Roadside spraying is where the co-op rig really comes into its own. As the photos below show, the rig has a long boom. The operator is a whiz at moving it around all the small trees and signs. 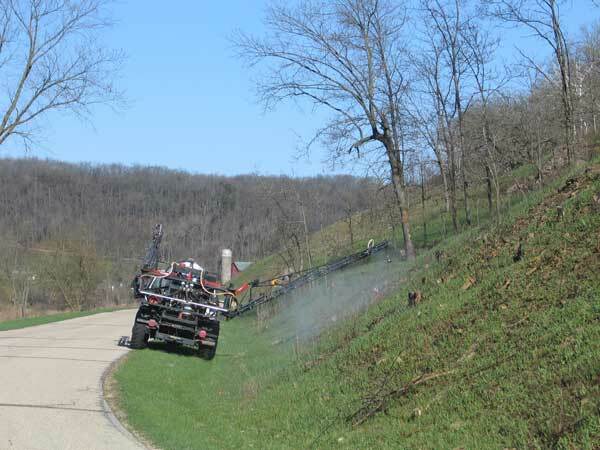 The whole half-mile-long road cut here was sprayed in about 15 minutes, a task that would have taken hours or days with backpack sprayers. The roadside spraying was done in 2005 and was very effective. Smooth brome died and left mostly bare soil. A week after spraying, the whole road cut was planted with a mixture of prairie grasses and forbs, and we planted again the following year. A view of this roadside five years later (2010) is shown below. Smooth brome is virtually absent, and the site is dominated by little bluestem. Earlier in the season, before the grass takes over, this roadside is lush with prairie forbs. There is one downside to this technique, although it can be rectified. Some prairie species, such as thistles, overwinter as vegetative rosettes, and will be killed. Indeed, we lost swamp and pasture thistle virtually completely when we treated the Crane Prairie. However, since these are both biennials, they establish well from seed, and can be replanted a few days after spraying. 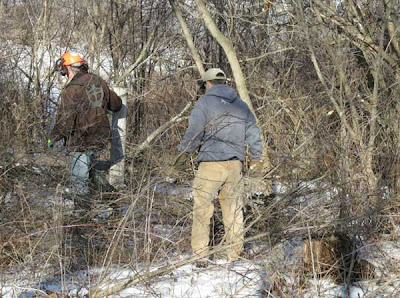 This winter Amanda has been taking advantage of the light snow to continue clearing brush on the North Woods. Because it seems especially interesting, we are focusing on the NE corner. 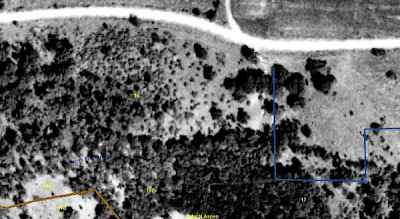 The 1937 air photo above shows this corner of the property. There is a group of large trees right near the property line (the straight blue line), although all of those east of the line are gone (there is a house there now). The road is County Highway F and the driveway across from the woods at that time went to the Joe Dybdahl farm. The small black dots to the west of the large trees are either young trees or clumps of brush, and probably suggest a logging operation. It is not surprising that this area would have been logged, since it is relatively level and close to the road. Before we started clearing this corner, the brush and small trees were so thick that you could not see into the woods. As we climbed around in this area, I noticed several large trees, remnants from those visible in the 1937 air photo. It seemed reasonable to "daylight" these trees, and today Amanda and Diane did just that. The preliminary result can be seen in the photo below. A quick survey showed that these trees (probably northern red oaks, Quercus rubra) were originally open grown (savanna) oaks, but most of the large lower branches are now dead. Dead lower branches is a common occurrence when savannas are allowed to brush in. We plan to help keep this area open by burning this corner of the woods next November when we do our biennial woods burn. We also planted this area about two weeks ago, so we can expect to eventually have a good herbaceous understory. Progress is made a few steps at a time! West Dane Conservancy on Reeve Road did a prescribed burn today. From a distance it looked like some planted prairies and one of their major prairie remnants. Yes, it is February 19! The earliest we have ever burned the big prairie/savanna remnant on our south-facing slope is March 15, almost a month from now. Were they rushing the season? Well, Prairie Home Estates did a burn in mid January 2012. Whether this is a foreshadowing of global warming, or some strange fluke of the weather, remains to be seen. 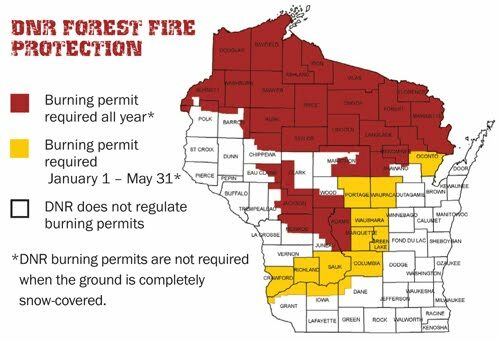 In a number of states private landowners have created formal organizations to conduct prescribed burns. Although such cooperative prescribed burn associations (PBA) are mainly in states with extensive grazing rangeland, the concept might be adapted to other states. In an internet survey I carried out, using the search term "cooperative prescribed burn associations", I found "hits" in the following states: Alabama; California; Kansas; Missouri; Montana; Nebraska; Oklahoma; Texas. Some of these states (Kansas, Oklahoma, Texas) seem to have a large number of such associations, organized by county. For instance, the PBA for the Edwards Plateau area of Texas has over 450 landowners with 9 chapters. A principal goal of these Cooperative PBAs is to provide support for landowners who want to burn but do not have the expertise or equipment to do so on their own. Many of the PBAs provide training and some own equipment such as pumper units that can be shared. Most of them have created formal structures (NGOs), and some have web sites. As far as I know, the PBA concept has not found a home in Wisconsin, despite the growing awareness of the importance of prescribed fire in land management. In contrast to the rangeland states, we don't have large landowners who manage land for profit, land that must be burned if its quality (mainly for grazing) is to be maintained. However, those interested in doing prescribed burns on their land might want to explore the PBA concept. Yesterday we planted a long cleared strip along the east end of the road cut of County Highway F. This was the final part of County F that had been cleared by the PVC Crew in Sept-Dec 2011. Since this is north-facing and essentially oak woodlands, the seeds were a mixture of woods and savanna species, things like woodland thimbleweed, golden Alexanders, and shade-loving goldenrods and asters. Separately, we planted grasses that do better in shady areas (C3 grasses): bottlebrush, silky rye, riverbank rye, and woodland brome. Although the main seed mix was planted more or less uniformly along the road cut, the grasses were planted in patches or swaths. Even though the south-facing hill is completely snow-free, this north-facing area still had lots of snow. This made it easy to see where we had already planted, because of our footsteps and the seeds themselves visible on the snow. However, the snow was a hard crust, so footing was rather uncertain. You could walk on top until you suddenly sank down a foot or so. A light-weight person can do a better job under these conditions. Although the road cut had not been burned, we felt it all right to plant now because the extensive clearing that we had done really opened up the site, so the seeds (once the snow melts) will find their way down to the soil. 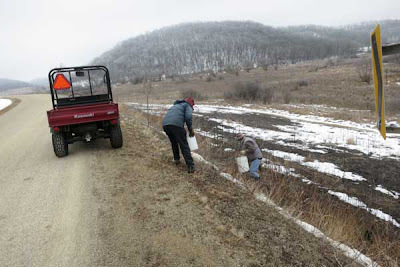 We won't be burning the north woods until November 2012 so the seeds should have a good chance to get established. "Taking fire out of the prairie and savanna is like taking rain out of the rainforest." Without fire, brush gets started, and within a few years (depending on the conditions) brush gets so heavy that fire will no longer carry. Major restoration work is then needed to return such habitats to their rightful condition. Prairies and savannas can't exist without fire. How frequent? Annually, according to the latest research. Remember: Prescribed fire is the most economical tool of restoration ecology. It is so important that there must be a strong sense of urgency to "get it done". 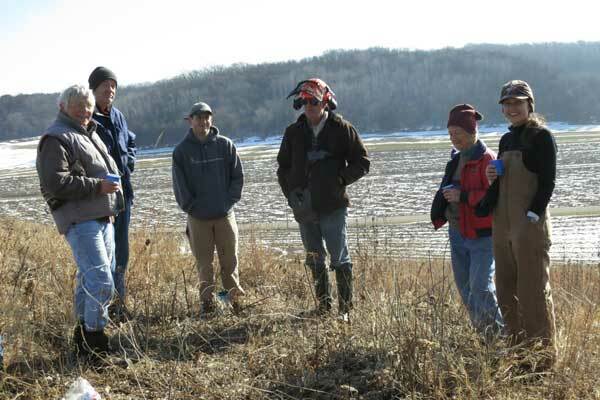 Yesterday we ran our monthly work party at Black Earth Rettenmund Prairie. The weather was ideal, we had a nice group of volunteers, and we got a lot done. This time of year we do brush control, and the weather this winter has been great. We had five treaters, which is ideal for such tangled brush. My knowledge of the finer geology of this area comes from ArcGIS. The Wisconsin Geological Survey kindly sent me a map layer with the bedrock geology of Dane County and I was able to overlay a recent air photo and use that to chart the dolomite here. There is a tiny area of the Black Earth Dolomite, a member of the St. Lawrence Formation (Cambrian age). Although I have not done calcium measurements here, my work on the same formation at Pleasant Valley Conservancy (just a few miles away) provides good soil chemistry data. It is interesting to note that as we move off the prairie and into the woods, buckthorn increases markedly. 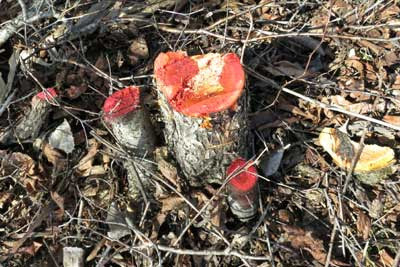 In fact, we cut one large buckthorn right at out property boundary (see photo of the cut stump). This was a real tree, and was probably 40-50 years old. Today Susan, Kathie, and I planted seeds on the Crane Prairie road cut. This prairie had been burned in November. We prefer to plant a unit after it has been burned, since the seeds have a much better chance of reaching the soil. 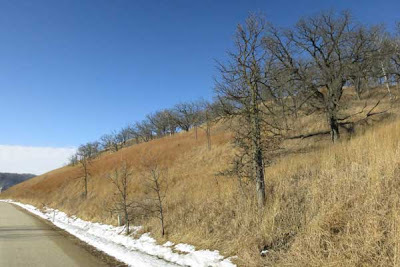 Although this prairie had been originally planted in December 2005 and had just finished its sixth growing season, the road cut still needed help. The steep, south-facing slope, is dry to dry-mesic in character. 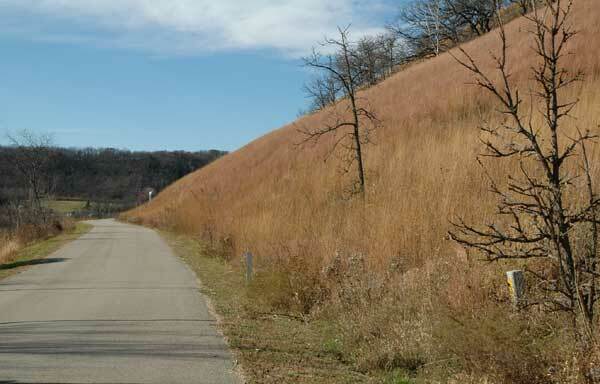 Ultimately, we would like to see little bluestem as the dominant plant, with a mixture of dry-site forbs. Planting a road cut is fairly tricky, since footing is difficult. A dry winter is ideal, since frozen ground provides a stable base. Today, most of the road cut was snow-free. We mixed the seeds with sawdust in the barn and distributed into six buckets. Kathie planted along the top of the road cut, throwing seeds down, and Susan walked along the bottom throwing seeds up. (I had the easy job, using the Mule to distribute buckets along the road.) There was just a light wind, so the seeds mostly went where they were thrown. Is planting a road cut worth doing? Definitely yes. 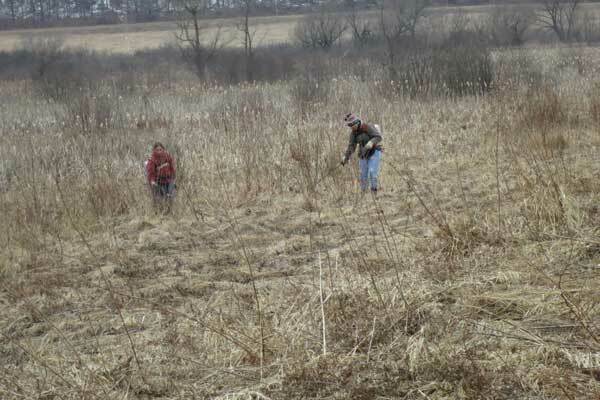 The road cut is usually the most difficult location to get prairie established. Parts of it have usually been mowed, which often encourages the growth of smooth brome, an exotic rhizomatous grass that is very difficult to eliminate. Although the Crane Prairie road cut, being downhill, had not been mowed, it had a different problem, heavy brush: brambles, honeysuckle, and sumac. These had been eradicated either by cutting and treating, or basal bark. (The last sumac clone was dealt with in November, just before the burn.) Getting a good prairie sod established is an important goal, because it will provide fuel for burns and hence discourage brush. The photo below shows what one hopes a road cut will eventually look like. This area is just across the road from the Crane Prairie, and has been under restoration for about 15 years. Little bluestem is the dominant, but lots of other "good" prairie species are present. We still have plenty of planting to do, although most of it will have to wait until our spring burns are finished (not too far in the future!). The photo above incorporates one of the large bur oaks, as well as the largest effigy mound. It is interesting to note how "urban" this savanna is. 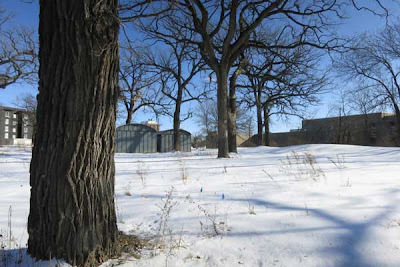 In addition to the Natatorium (built in the early 1960s), there is the new lakeshore dormitory visible in the background, plus some relic maintenance buildings that crowd not only some of the oaks but also the mounds. Buildings like the two small gray ones can be seen all over Madison. Many of these buildings were built by the Trachte Company of Sun Prairie and date back to the 1920s. These two here probably qualify for listing on the National Register of Historic Buildings! Not visible, but hidden on this site and known to bacteriologists, is the location where a dead cow infected with anthrax was buried. According to one news report from U.W., this cow was part of an outbreak of anthrax on campus. At one time there was a sign marking the site. About two years ago a local resident who knew the site took me to see it. Despite the notoriety of anthrax spores, there should no longer be a hazard here. The brass plaque at the edge of the mounds, shown in thephoto, was typical of those that the university installed in the 1920s. These plaques were constructed under the purview of State Archeologist Charles E. Brown. 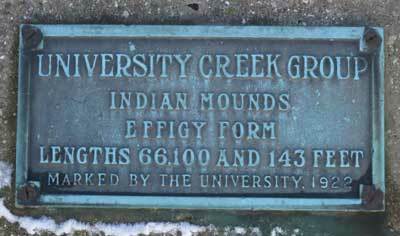 Similar plaques can be found elsewhere on campus, as this area was one of the prime habitation sites of the Middle to Late Woodlands peoples.